As soon as the snow recedes and the ice melts, people look longingly at the lakes and rivers and wish for a boat of their own. Area boat retailers offer some pointers about selecting an appropriate watercraft. The first question that prospective buyers need to ask themselves is what they want to do in the boat. Whether it’s fishing, skiing, cruising around or doing a little bit of everything, how you use the boat will determine which craft is right for you. Gordy’s Marine in Lake Geneva is a Cobalt and MasterCraft dealer, and sells boats suited to a variety of uses. 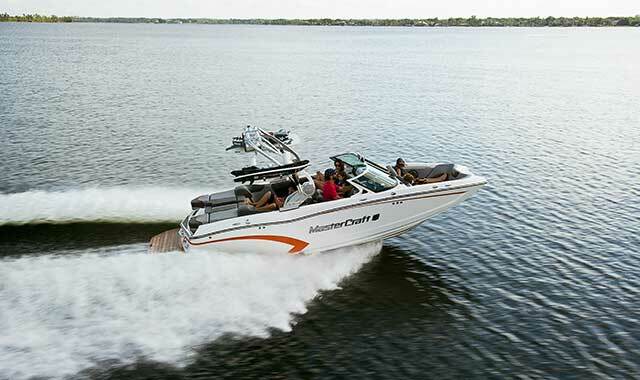 But, if loud music and fast action are more preferred, consider the popular MasterCraft line, says Whowell. Jeremy Anderson, sales manager at Gage Marine, in Williams Bay, Wis., on Geneva Lake, also sells MasterCraft and says the line is a good choice for wake surfing enthusiasts. Gage Marine also carries the Bennington, Boston Whaler, Monterey and Centurion boat lines. If the plan is to cruise the lake and view the cabins and shoreline, a pontoon might be a good fit, says Anderson. In particular, he recommends the Bennington, one of the most popular pontoon brands available. In the past, pontoons were little more than a floating platform. Those days are gone. Randy Drozd, service manager at Five Star Boat Center in Fox Lake, agrees with Anderson that the modern pontoons have come a long way. Many past models, he says, looked chintzy and lacked aesthetic appeal, but many newer models are fairly elegant and stylish. Drozd recommends that, when looking for a new boat, prospective buyers should remember that boating is a social activity. Accordingly, it’s hard to determine how many seats you’ll need by simply counting family members. Another good rule of thumb, Drozd says, is not to judge a boat’s capacity by the seating arrangement. Once the search is narrowed down to a couple of options, the next step is to take it for a spin. Another important factor, when purchasing a boat, is the kind of support you’ll receive after making the purchase. There are several questions to consider before you buy. Keeping your boat properly maintained and serviced can help to prevent a weekend ruined by boat troubles, says Whowell, of Gordy’s. Proper service begins with a reliable dealership, one that will have your back if something goes wrong. Before buying, be sure to visit some potential marinas and boat sellers, to find out who makes support a priority. At Five Star, customers are reminded ahead of the spring rush to get their boats prepped. Prospective owners should also consider how marinas treat non-customers. Local experts agree that it’s best to do your homework before making any boat purchase. If you know what you want to do on the water, who you’ll have on the boat and which support team is prepared to help in an emergency, navigating your boat purchase will be smooth sailing. This entry was posted on Monday, May 11th, 2015 at 11:59 am	and is filed under Recreation & Destinations. You can follow any responses to this entry through the RSS 2.0 feed. Both comments and pings are currently closed.